South of the Mason-Dixon line, the term “soul food” conjures up images of fried chicken, cornbread and limp, bacon-grease saturated vegetables. But for John Korzekwinski, owner of J. Betski’s restaurant in Raleigh, N.C., the food that comes straight from his heart involves roasted beets, fresh local pork, and just-tender cabbage stewed to perfection. As a child, for Korzekwinski the family kitchen was often redolent with the rich scent of goulash, lentils and sauerbraten. Family holidays were an especially festive time. His uncle, who was a butcher in Queens, always prepared a special holiday kielbasa. This recipe is one that has survived in its almost original form at J. Betski’s today. “To me, the biggest compliment, the greatest honor is when someone says, ‘It reminds me of my aunt or grandmother,” Korzekwinski said. The menu has influences from Germany, Austria and other regions of Eastern Europe, in addition to distinctively Polish flavors. Homesick Poles will enjoy the many varieties of pierogi, including one made with North Carolina barbeque sauce. The Austrian potato salad, a side with the delectable pork schnitzel, is cool, crisp and delicious on a summer evening. The cocktail menu also boasts unusual drinks sure to tickle the palate. The “Beet Jammer,” a drink made with beet infused vodka, apple cider and spicy ginger ale has been a hit with adventurous drinkers. Some people unfamiliar with Eastern European cuisine may take some convincing. But Korzekwinski takes pride in bringing a new cuisine to the region. But, according to Korzekwinski, once they come in and give it a try, they are usually “very pleasantly surprised” and tend to be loyal customers. Korzekwinski tries to use local meats and vegetables whenever possible and often cooks with the bounty available at the farmer’s market to enhance his dishes. The interior of the restaurant has beautiful, dark wood paneling and soft amber light. The top of the bar is adorned with intricately decorated steins from Germany. St. Casimir, patron saint of the restaurant, keeps an eye on goings-on from the maître d’s table. The restaurant’s logo, a crowned eagle grasping grapes in one talon and a sheaf of wheat in the other, looks out on regulars from behind the bar. “I was always fascinated by coats of arms,” Korzekwinski said. So, he had a friend design one for the restaurant. The logo evokes Poland’s own crowned eagle, found on crests and flags for centuries. Korzekwinski wanted his eagle to hold grapes to represent the Rieslings the restaurant is known for and wheat for the other forms of sustenance he offers. 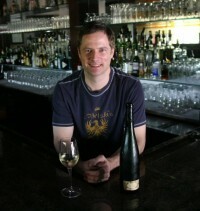 J. Betski’s opened five years ago, and like many fine dining restaurants, it has faced challenges during the recession. But Korzekwinski is up to the challenge.